The oxygen family consists of the elements that make up group 16 on the periodic table: oxygen, sulfur, selenium, tellurium, and polonium. These elements all have six electrons in their outermost energy level, accounting for some common chemical properties among them. In another respect, the elements are quite different from each other. Oxygen is a gaseous nonmetal; sulfur and selenium are solid nonmetals; tellurium is a solid metalloid; and polonium is a solid metal. Acid: Substances that, when dissolved in water, are capable of reacting with a base to form salts and release hydrogen ions. Allotrope: One of two or more forms of an element. Combustion: A form of oxidation that occurs so rapidly that noticeable heat and light are produced. Cracking: The process by which large hydrocarbon molecules are broken down into smaller components. Lithosphere: The solid portion of Earth, especially the outer crustal region. LOX: An abbreviation for liquid oxygen. Metallurgy: The science and technology that deals with gaining metals from their ores and converting them into forms that have practical value. Nascent oxygen: An allotrope of oxygen whose molecules each contain a single oxygen atom. Ozone: An allotrope of oxygen that consists of three atoms per molecule. Producer gas: A synthetic fuel that consists primarily of carbon monoxide and hydrogen gases. Oxygen is a colorless, odorless, tasteless gas with a melting point of −218°C (−360°F) and a boiling point of −183°C (−297°F). It is the most abundant element in Earth's crust, making up about one-quarter of the atmosphere by weight, about one-half of the lithosphere (Earth's crust), and about 85 percent of the hydrosphere (the oceans, lakes, and other forms of water). It occurs both as a free element and in a large variety of compounds. In the atmosphere, it exists as elemental oxygen, sometimes known as dioxygen because it consists of diatomic molecules, O 2 . In water it occurs as hydrogen oxide, H 2 O, and in the lithosphere it occurs in compounds such as oxides, carbonates, sulfates, silicates, phosphates, and nitrates. Oxygen also exists in two allotropic forms (physically or chemically different forms of the same substance): one atom per molecule (O) and three atoms per molecule (O 3 ). The former allotrope is known as monatomic, or nascent, oxygen and the latter as triatomic oxygen, or ozone. Under most circumstances in nature, the diatomic form of oxygen predominates. In the upper part of the stratosphere, however, solar energy causes the breakdown of the diatomic form into the monatomic form, which may then recombine with diatomic molecules to form ozone. The presence of ozone in Earth's atmosphere is critical for the survival of life on Earth since that allotrope has a tendency to absorb ultraviolet radiation that would otherwise be harmful or even fatal to both plant and animal life on the planet's surface. Oxygen was discovered independently by Swedish chemist Carl Scheele (1742–1786) and English chemist Joseph Priestley (1733–1804) in the period between 1773 and 1774. The element was given its name in the late 1770s by French chemist Antoine Laurent Lavoisier (1743–1794). Its name comes from the French word for "acid-former," reflecting Lavoisier's incorrect belief that all acids contain oxygen. Production. By far the most common method for producing oxygen commercially is by the fractional distillation of liquid air. A sample of air is first cooled to a very low temperature in the range of −200°C (−330°F). At this temperature, most gases that make up air become liquid. The liquid air is then allowed to evaporate. At a temperature of about −196°C (−320°F), nitrogen begins to boil off. When most of the nitrogen is gone, argon and neon also boil off, leaving an impure form of oxygen behind. The oxygen is impure because small amounts of krypton, xenon, and other gases may remain in the liquid form. In order to further purify the oxygen, the process of cooling, liquefying, and evaporation may be repeated. Oxygen is commonly stored and transported in its liquid form, a form also known as LOX (for l iquid ox ygen). LOX containers look like very large vacuum bottles consisting of a double-walled container with a vacuum between the walls. The element can also be stored and transported less easily in gaseous form in steel-walled containers about 1.2 meters (4 feet) high and 23 centimeters (9 inches) in diameter. In many instances, oxygen is manufactured at the location where it will be used. The process of fractional distillation described earlier is sufficiently simple and inexpensive so that many industries can provide their own oxygen-production facilities. Uses. Oxygen has so many commercial, industrial, and other uses that it consistently ranks among the top five chemicals in volume of production in the United States. In 1990, for example, about 18 billion kilograms (39 billion pounds) of the element were manufactured in the United States. The uses to which oxygen is put can be classified into four major categories: metallurgy, rocketry, chemical synthesis, and medicine. In the processing of iron ore in a blast furnace, for example, oxygen is used to convert coke (carbon) to carbon monoxide. The carbon monoxide, in turn, reduces iron oxides to pure iron metal. Oxygen is then used in a second step of iron processing in the Bessemer converter, open hearth, or basic oxygen process method of converting "pig iron" to steel. In this step, the oxygen is used to react with the excess carbon, silicon, and metals remaining in the pig iron that must be removed in order to produce steel. Another metallurgical application of oxygen is in torches used for welding and cutting. The two most common torches make use of the reaction between oxygen and hydrogen (the oxyhydrogen torch) or between oxygen and acetylene (the oxyacetylene torch). Both kinds of torch produce temperatures in the range of 3,000°C (5,400°F) or more and can, therefore, be used to cut through or weld the great majority of metallic materials. In the form of LOX, oxygen is used widely as the oxidizing agent in many kinds of rockets and missiles. For example, the huge external fuel tank required to lift the space shuttle into space holds 550,000 liters (145,000 gallons) of liquid oxygen and 1,500,000 liters (390,000 gallons) of liquid hydrogen. When these two elements react in the shuttle's main engines, they provide a maximum thrust of 512,000 pounds. The chemical industry uses vast amounts of oxygen every year in a variety of chemical synthesis (formation) reactions. One of the most important of these is the cracking of hydrocarbons by oxygen. Under most circumstances, heating a hydrocarbon with oxygen results in combustion, with carbon dioxide and water as the main products. However, if the rate at which oxygen is fed into a hydrocarbon mixture is carefully controlled, the hydrocarbon is "cracked," or broken apart to produce other products, such as acetylene, ethylene, and propylene. Various types of synthetic fuels can also be manufactured with oxygen as one of the main reactants. Producer gas, as an example, is manufactured by passing oxygen at a controlled rate through a bed of hot coal or coke. The majority of carbon dioxide produced in this reaction is reduced to carbon monoxide so that the final product (the producer gas) consists primarily of carbon monoxide and hydrogen. Perhaps the best-known medical application of oxygen is in oxygen therapy, where patients who are having trouble breathing are given doses of pure or nearly pure oxygen. Oxygen therapy is often used during surgical procedures, during childbirth, during recovery from heart attacks, and during treatment for infectious diseases. In each case, providing a person with pure oxygen reduces the stress on his or her heart and lungs, speeding the rate of recovery. Pure oxygen or air enriched with oxygen may also be provided in environments where breathing may be difficult. Aircraft that fly at high altitudes, of course, are always provided with supplies of oxygen in case of any problems with the ship's normal air supply. Deep-sea divers also carry with them or have pumped to them supplies of air that are enriched with oxygen. Finally, oxygen is essential to all animal life on Earth. A person can survive a few days or weeks without water or food but no more than a few minutes without oxygen. In the absence of oxygen, energy-generating chemical reactions taking place within cells would come to an end, and a person would die. Sulfur is a nonmetallic element that can exist in many allotropic forms (physically or chemically different forms of the same substance). The most familiar are called rhombic and monoclinic sulfur. Both are bright yellow solids with melting points of about 115°C (239°F). A third form is called plastic or amorphous sulfur. It is a brownish liquid produced when rhombic or monoclinic sulfur is melted. Sulfur itself has no odor at all. It has a bad reputation in this regard, however, because some of its most common compounds have strong smells. Sulfur dioxide, one of these compounds, has a sharp, choking, suffocating effect on anyone who breathes it. The "fire and brimstone" of the Bible was one of the worst punishments that its authors could imagine. The brimstone in this expression referred to burning sulfur, or sulfur dioxide. The fact that sulfur comes from deep under the ground and that sulfur dioxide can be smelled in the fumes of volcanoes further fueled people's imaginations of what Hell must be like. A second sulfur compound with a bad odor is hydrogen sulfide. The strong smell of rotten eggs is due to the presence of this compound. Occurrence and preparation. Sulfur is the sixteenth most abundant element in Earth's crust. It occurs both as an element and in a variety of compounds. As an element it can be found in very large, underground mines, most commonly along the Gulf Coast of the United States and in Poland and Sicily. The sulfur is extracted from these mines by means of the Frasch process. In this process, superheated steam is pumped through the outermost of a set of three pipes. Compressed air is forced down the innermost pipe. The superheated steam causes the underground sulfur to melt, and the compressed air forces it upward, through the middle of the three pipes, to Earth's surface. Sulfur is also widely distributed in the form of minerals and ores. Many of these are in the form of sulfates, including gypsum (calcium sulfate, CaSO 4 ), barite (barium sulfate, BaSO 4 ), and Epsom salts (magnesium sulfate, MgSO 4 ). Others are metal sulfides, including iron pyrites (iron sulfide, FeS 2 ), galena (lead sulfide, PbS), cinnabar (mercuric sulfide, HgS), stibnite (antimony sulfide, Sb 2 S 3 ), and zinc blende (zinc sulfide, ZnS). The sulfur is recovered from these metal ores by heating them strongly in air, which converts the sulfur to sulfur dioxide and releases the pure metal. Then the sulfur dioxide can go directly into the manufacture of sulfuric acid, which is where more than 90 percent of the world's mined sulfur winds up. Uses of sulfur and its compounds. Some sulfur is used directly as a fungicide and insecticide, in matches, fireworks, and gunpowder, and in the vulcanization of natural rubber (a treatment that gives rubber elasticity and strength). Most, however, is converted into a multitude of useful compounds. Sulfuric acid is by far the most important of all sulfur compounds. Nearly 90 percent of all sulfur produced is converted first into sulfur dioxide and then into sulfuric acid. The acid consistently ranks number one among the chemicals produced in the United States. In 1990, more than 40 billion kilograms (89 billion pounds) of sulfuric acid were manufactured, more than 50 percent as much as the second most popular chemical (nitrogen gas). Sulfuric acid is used in the production of fertilizers, automobile batteries, petroleum products, pigments, iron and steel, and many other products. The sulfur cycle. Like nitrogen, carbon, and phosphorus, sulfur passes through the gaseous, liquid, and solid parts of our planet in a series of continuous reactions known as the sulfur cycle. The main steps in the sulfur cycle are illustrated in the accompanying figure. Sulfur is produced naturally as a result of volcanic eruptions and through emissions from hot springs. It enters the atmosphere primarily in the form of sulfur dioxide, then remains in the atmosphere in that form or, after reacting with water, in the form of sulfuric acid. Sulfur is carried back to Earth's surface as acid deposition when it rains or snows. On Earth's surface, sulfur dioxide and sulfuric acid react with metals to form sulfates and sulfides. The element is also incorporated by plants in a form known as organic sulfur. Certain amino acids, the compounds from which proteins are made, contain sulfur. Organic sulfur from plants is eventually passed on to animals that eat those plants. It is, in turn, converted from plant proteins to animal proteins. 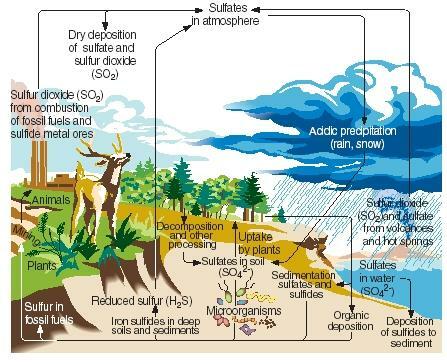 When plants and animals die, sulfur is returned to the soil where it is converted by microorganisms into hydrogen sulfide. Hydrogen sulfide gas is then returned to the atmosphere, where it is oxidized to sulfuric acid. Human activities influence the sulfur cycle in a number of ways. For example, when coal and metallic ores are mined, sulfur and sulfides may be released and returned to the soil. Also, the combustion of coal, oil, and natural gas often releases sulfur dioxide to the atmosphere. This sulfur dioxide is added to the amount already present from natural sources, greatly increasing the amount of acid precipitation that falls to Earth's surface. Some people believe that acid precipitation (or acid rain) is responsible for the death of trees and other plants, the acidification of lakes that has hurt marine animals, damage to metal and stone structures, and other environmental harm. Selenium and tellurium are both relatively rare elements. They rank in the bottom ten percent of all elements in terms of abundance. They tend to occur in Earth's crust in association with ores of copper and other metals. Both are obtained as a by-product of the electrolytic refining of copper. During that process, they sink to the bottom of the electrolysis tank, where they can be removed from the sludge that develops. Selenium occurs in a variety of allotropic forms (physically or chemically different forms of the same substance), the most common of which is a red powder that becomes black when exposed to air. The element's melting point is 217°C (423°F), and its boiling point is 685°C (1,265°F). Tellurium is a silvery-white solid that looks like a metal (although it is actually a metalloid). Its melting point is 450°C (842°F), and its boiling point is 990°C (1,814°F). Selenium has an interesting role in living organisms. It is essential in very low concentrations for maintaining health in most animals. In fact, it is often added to animal feeds. In higher concentrations, however, the element has been found to have harmful effects on animals, causing deformed young and diseased adults. The primary uses of selenium are in electronics and in the manufacture of colored glass. Photocopying machinery, solar cells, photocells, television picture tubes, and electronic rectifiers and relays (used to control the flow of electric current) all use selenium. Some of the most beautiful colored glasses, ranging from pale pink to brilliant reds, are made with compounds of selenium. Small amounts of tellurium are also used in the production of colored glass. More than 90 percent of the element, however, goes to the production of alloys of iron and other metals. Polonium has 27 isotopes, all of which are radioactive. It occurs naturally in uranium ores, where it is the final product in the long series of reactions by which uranium undergoes radioactive decay. It is one of the rarest elements on Earth, with an abundance of no more than about 3 × 10 −10 parts per million. The discovery of polonium in 1898 by Polish-French chemist Marie Curie (1867–1934) is one of the most dramatic stories in the history of science. She processed tons of uranium ore in order to obtain a few milligrams of the new element, which she then named after her homeland of Poland. Polonium finds limited use in highly specialized power-generating devices, such as those used for space satellites and space probes. I have a questoin for you. -Does sulfur water harm electronics? I heard putting pennies around your TV and electronics protect it from the sulfur gas. Lately I have been studying extremely hard about the oxygen family. I have learned more about this family from the periodic table than I ever thought that I would. Right now in chemistry I have been learning how to write chemical formulas, and how to draw electron dot diagrams. At first I found it very confusing but eventually I got the hang of it. Is their any medical use for Sulfer dioxide? Well it combust in a hot garage? How do you dispose of a canister of this stuff? Well it is a good source and children based educational material!It can easily understood and very informative. if there would be no sulfur occur,what will happen to our environment? what are the examples of polonium compounds,im reffering to its chemical equation,structural equation and their properties?